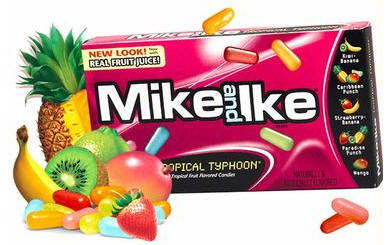 Mike and Ike Tropical Typhoon Candy 24ct box - It's a force of nature! TROPICAL TYPHOON is jam-packed with flavors to set your taste buds twirling of Paradise Punch, Kiwi-Banana, Caribbean Punch, Strawberry-Banana and Mango. It's a force of nature! TROPICAL TYPHOON is jam-packed with flavors to set your taste buds twirling of Paradise Punch, Kiwi-Banana, Caribbean Punch, Strawberry-Banana and Mango.